Sharing half of their name with one of Britain’s most famous secret service agents it’s no surprise that James Knight are the “double 0” operatives of the fish world. From humble beginnings (like us!) they’ve grown over 100 years to serve some of the best restaurants in the UK and even the royal family enjoy their fresh coastal fish. 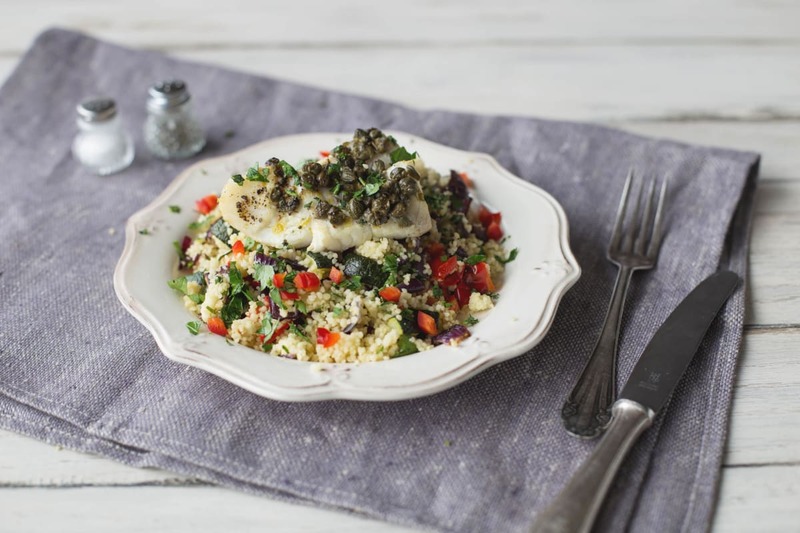 For this recipe we ordered some of their tastiest cod and roasted it with a caper lemon sauce for a dinner which has a licence to thrill*. Pre-heat your oven to 200 degrees and boil 250ml of water. Remove the core from the pepper and chop ¾ into bite-sized chunks. Very finely dice the remaining ¼ of the pepper and leave raw. Peel the onion and chop both this and the courgette into bite-sized chunks too. 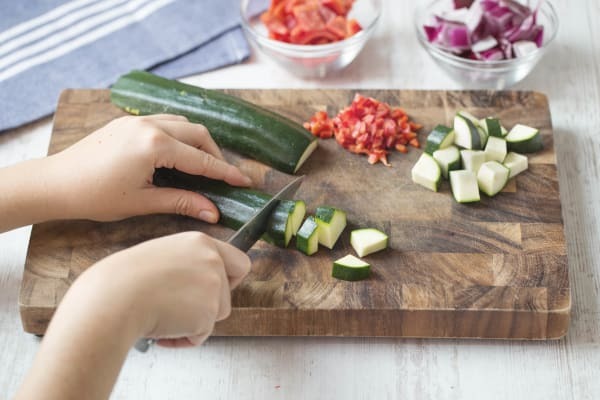 Toss the red pepper chunks (not the finely diced red pepper), the courgettes & the onion in 1 tbsp of olive oil & a pinch of salt and pepper. Lay in a single layer on a baking tray and roast on the top shelf of the oven for 20 mins. 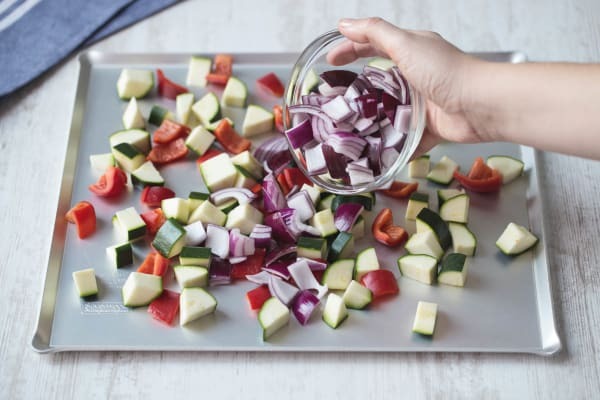 The vegetables are ready when cooked through and crispy at the edges. Mix ½ the vegetable stock pot and 1 tsp of olive oil with the 350ml of boiling water. In a bowl, pour the water over the couscous and cover with a tight lid. Leave for 15 mins and do not peek under the lid! Heat a small saucepan on low heat and add 1 tbsp of butter from your fridge (if you don’t have any use some olive oil). As soon as the butter has melted remove the pan from the heat, add the capers, a pinch of lemon zest & a tsp of lemon juice. 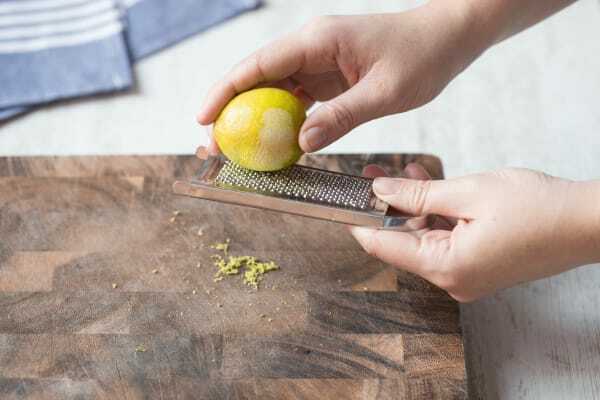 Tip: To zest simply use your grater’s finest side to grate, but don’t go down to the white pith. When the veggies are 10 mins from being cooked turn to your cod. 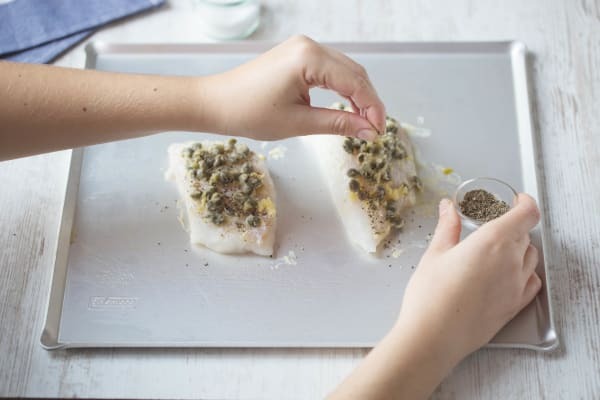 Place the cod on a lightly greased baking tray and drizzle over half of the caper mixture. Season well with salt and pepper and cook on the top shelf of the oven for 10 mins. You can move the veggies to the middle shelf as they’ll be half cooked already. Fluff up your couscous using a fork and toss with the cooked veggies. Finely chop 1½ tbsp of parsley and toss this into the couscous. Grate in a couple of pinches of lemon zest and the raw red pepper. Taste for seasoning and add a little more salt and pepper if needed. Top with the roasted cod and drizzle over a little more of the caper mixture. Sprinkle over a little more chopped parsley and tuck in! T: If you find the flavour of capers too strong, then remove them before pouring the butter sauce over the fish.